When Ash Barty walks onto the court to face Maria Sharapova it won’t just be 24 million Australians she can count on for support. A significant portion of the women’s tour will also be on her side due to one of the most interesting personality clashes in sport. While tennis is a brutally individual sport on the court, off it the professional tour is a community in which enduring friendships and relationships are formed among competitors. In the first week of a grand slam, the locker room is a hive of activity where the players spend hours in the same room before going out into combat. Sharapova, however, has always been a lone wolf, forging her path to greatness her way. She doesn’t value friendships with her competitors and has never spent time trying to build them, a point that is well known and that she has never expressed regret about. It’s a trait that grates many of her colleagues on the women’s tour, who see her as cold and aloof. Add those factors to a two-year doping ban, which was eventually shortened to 15 months, and you get a recipe for an extremely difficult comeback, with personality clashes that had previously been private spilling into the public arena as players voiced their disapproval about the five-time grand slam champion. 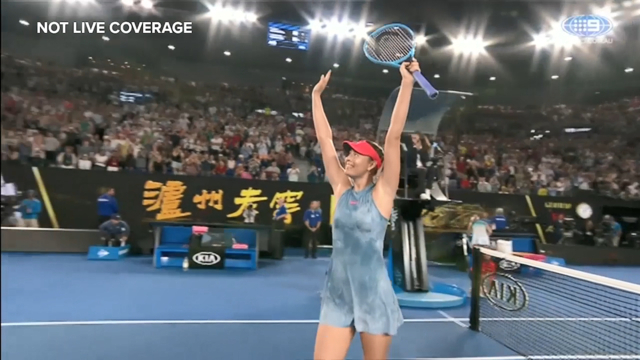 While every player is entitled to their opinion, the strength of the reaction to Sharapova’s return has been “unfair”, according to Channel Nine commentator Sam Smith, who says the facts that were ruled on by the Court of Arbitration haven’t properly been taken into account. “It was an emotional reaction not based on the facts,” Smith told Wide World of Sports. “The judgment of the Court of Arbitration was that the doping was unintentional and that was a pretty important feature to have the ban reduced, I think it was a very heavy ban. “So the players' reaction was based on personal dislike. It was emotional because she doesn't speak in the locker room. That's it. “They had an opportunity to have a go at her and they took it. And it was very hard. Players as high profile as Caroline Wozniacki voiced her disapproval of Sharapova’s status in the game in the early days that followed her return to tennis in 2017. The Dane, who was then ranked five in the world, served it up to the United States Tennis Association for what she perceived as preferential treatment after her Russian rival played her first round US Open match on centre court, while Wozniacki slugged it out with Ekaterina Makarova in the relative anonymity of Court 17 after initially being scheduled to play on Court 5. “Putting out a schedule where the number five in the world is on court five, fifth match on, that’s unacceptable,” Wozniacki said to a Danish publication at the time. It was a moment for Wozniacki to speak out almost as an unofficial spokesperson for the women’s tour and Smith believes that sort of sentiment rocked Sharapova. However, as Smith points out, time is a great healer and while Sharapova still doesn’t get a warm reaction from the players, for most of them the doping ban is old news now. It’s also true that the Russian hasn’t been nearly as dominant on the court since her return. Although she clinched one title in the first 12 months of her comeback she’s never really found the groove that once gave her an aura of intimidation second only to Serena Williams’ at grand slams. While battling the locker room and the mental demons that come from a lengthy break at close to the age of 30 were part of the story, Sharapova has also picked up regular injuries in the 20 months since her return to the court, with her shoulder being the latest physical issue to make life difficult. It’s a mix that has resulted in a slower than expected climb up the rankings, with the former number one just scraping into the seedings for this tournament with a (30) next to her name. However, Friday’s match against Wozniacki seemed to welcome the return of the old Sharapova, even as she approaches her 32nd birthday. That’s ominous for Barty, who has a superior seeding but lacks the grand slam experience and pedigree of her fourth round opponent who Smith sees as the favourite to advance to the quarter final. “I will tell you, when she played Wozniacki, I don't know what she did in the off-season, I know she had a lot of problems with her shoulder, but she's trained so hard she's the fittest I've ever seen her,” Smith said. “I make her the favourite going out there against Barty, particularly if she plays like she did against Wozniacki. “ … I know she had a little injury to start the year but she looks hungry as ever with a point to prove, no one's going on about the ban anymore and these great champions, she's won five slams, she's won a career Slam, she's a great champion, they have an uncanny knack for when they get on the big stage, elevating their level, that's what she lives for, that's why she still plays.